Monaco and the British dependencies of Akrotiri and Dhekelia, Guernsey, the Isle of Man and Jersey are integral parts of the EU’s customs territory. French Polynesia, the French Southern and Antarctic Lands, New Caledonia, Saint Barthélemy, Saint Pierre and Miquelon and Wallis and Futuna: “The French overseas countries and territories to which the provisions of Part Four of the TFEU apply”. ^ Erskine, Daniel H (2006). “The United States-EC Dispute Over Customs Matters: Trade Facilitation, Customs Unions, and the Meaning of WTO Obligations”. Florida Journal of International Law. 18: 432–485. ^ “Taxation and Customs – FAQ”. European Commission. Archived from the original on 8 June 2012. Retrieved 12 September 2012. ^ “Council Regulation (EEC) No 2913/92 of 12 October 1992 establishing the Community Customs Code”. Official Journal of the European Union. 19 October 1992. Retrieved 12 September 2012. ^ “EUR-Lex – 12003T/PRO/03 – Act concerning the conditions of accession of the Czech Republic, the Republic of Estonia, the Republic of Cyprus, the Republic of Latvia, the Republic of Lithuania, the Republic of Hungary, the Republic of Malta, the Republic of Poland, the Republic of Slovenia and the Slovak Republic and the adjustments to the Treaties on which the European Union is founded – Protocol No 3 on the sovereign base areas of the United Kingdom of Great Britain and Northern Ireland on Cyprus”. eur-lex.europa.eu. ^ “EUR-Lex – 11972B/PRO/03 – DOCUMENTS CONCERNING THE ACCESSION TO THE EUROPEAN COMMUNITIES OF THE KINGDOM OF DENMARK, IRELAND, THE KINGDOM OF NORWAY AND THE UNITED KINGDOM OF GREAT BRITAIN AND NORTHERN IRELAND, PROTOCOL NO 3 ON THE CHANNEL ISLANDS AND THE ISLE OF MAN”. eur-lex.europa.eu. ^ “Andorra: Customs Unions and preferential arrangements”. European Commission. Archived from the original on 26 October 2012. Retrieved 12 September 2012. ^ “Agreement on Cooperation and Customs Union between the European Economic Community and the Republic of San Marino”. ^ “Decision No 1/95 of the EC-Turkey Association Council of 22 December 1995 on implementing the final phase of the Customs Union” (PDF). ^ a b c d “REGULATION (EU) No 952/2013 OF THE EUROPEAN PARLIAMENT AND OF THE COUNCIL of 9 October 2013 laying down the Union Customs Code, Article 4” (PDF). EURLEX. October 2013. p. 11. Retrieved 17 December 2018. 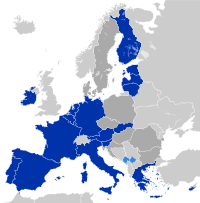 ^ “Consolidated Version of the Treaty on the Functioning of the European Union (Annex II)”. European Commission. p. 336. Retrieved 23 January 2019. ^ “Union Customs Code – Taxation and customs union – European Commission”. Taxation and customs union.